“Look at this guy here. He’s so full of honey – right here, on the edge. He’s just like glowing,” says the biochemistry major to the English professor. With a smoker smoldering away, the bees are loading up on food, in case of fire. They show little interest in two amateur beekeepers, a note-taker and a photographer. Last time freshman Christina Geldert and assistant professor Bryan Rasmussen checked the hive, one of the frames for honey-comb had no comb in it at all. Now the bees have filled it in, a good sign. There is also a lot of brood. However, the beekeepers can’t find much honey in the frames, which they inspect and brush like rare manuscripts pulled from a filing cabinet. They perform a hygiene test. Mess with the hive’s hexagonal tiles today, and in a couple of weeks the delicate masonry should be fixed, or something is wrong. 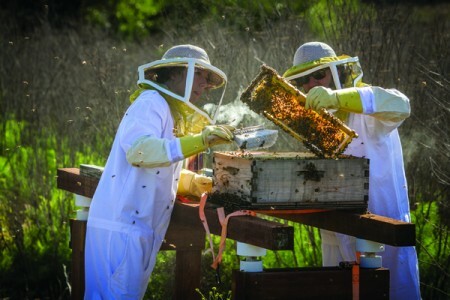 Aided by a local beekeeping expert, Geldert, Rasmussen and junior Ryan Glatt, an exercise science major, served as the university’s beekeepers this spring. They’ve been supported by a $2,000 grant to Rasmussen and the SEEd (Sustainable Edible Education) Project Garden from CLU’s Community Leaders Association. In addition to the pollinating, honey-producing bees, workers at SEEd intend to bring in worms to compost and ladybugs to control pests in the garden. Since the garden was established three years ago, the goal has been to build, in miniature, a self-sustaining system for food production and disposal, one that doesn’t rely on compost or seed from others. It’s a model that students can expand on and perhaps carry forward. Small-scale beekeeping is also important today as a hedge against the alarming dive in bee populations over the last decade. In response to Colony Collapse Disorder – a new, global phenomenon in which workers abandon hives, leading to a crisis for crops such as California almonds – European countries have placed a two-year ban on certain pesticides. U.S. beekeepers and environmental groups are suing the Environmental Protection Agency for similar action. On north campus, meanwhile, near the clank of bats from the baseball diamond, students will keep learning the basics of the beekeeping trade. Their knowledge comes from books, YouTube videos, regional workshops for like-minded amateurs, and one another.